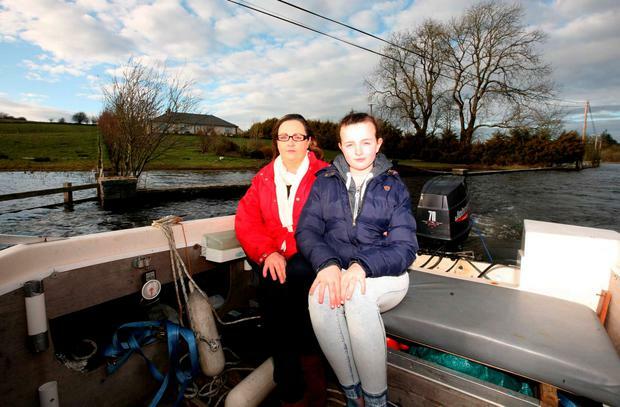 Caroline Collins and her daughter Amy (11) outside their home near Castleplunket, which is still cut off by flooding. Photo: Brian Farrell. A Roscommon mother has been unable to access her home for more than four months due to extensive flooding in her local village. Caroline Collins and her three daughters, Leonie (18), Aoife (16) and Amy (11), haven't been able to reach their home near the village of Castleplunket, Co Roscommon, since December 28 last year. It has had a devastating effect on the whole family. "It's been huge. We had Christmas presents under the Christmas tree and couldn't go back for about six weeks after that," Caroline said. The only route of access to the house would be to walk 1km through the rough terrain, she told the Irish Independent. "It's not practical to have to climb over fences and barbed wire every day. "The Civil Defence has brought me up a couple of times by boat to get in and out." Upon hearing of the damning flooding report released by the C&AG yesterday, she said acting government ministers needed to see her situation to believe it, and she said she was disappointed action had not been taken on the issue already. "The committee needs to get together, get the funds together and come out and see what's happening here - there's major issues around the place. "Without seeing it, you wouldn't believe anything that goes on. A guy was going through the village on a speedboat the other day," she added. Weather conditions of late have meant the flood water's height has dropped marginally, but it will be a while before the family gets home. "Unless we get fine weather for the next while, I suspect we'll be here for the next five weeks or more. It's hard to tell what will happen," she said.